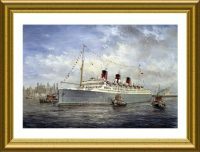 Thousands of spectators lined the banks of the Mersey on the 17th June 1939, to witness a very special occasion… the maiden Voyage of Cunard White Star’s new super liner RMS Mauretania. 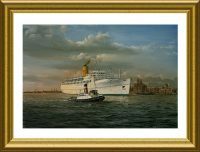 Lamport and Holt’s Voltaire is turning in the river, ready to start a West African cruise and in the background is one of those great Canadian Pacific Liners… What a wonderful scene Robert has ,managed to capture here. 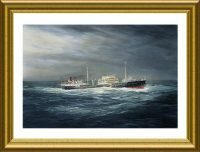 Sadly the Voltaire was lost to enemy Action during WW2, but in this magnificent painting she will live forever. 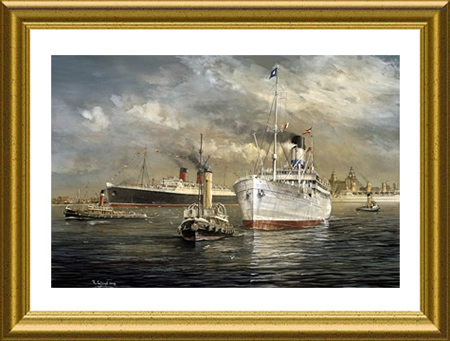 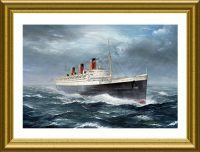 The size of this painting, framed in antique guilt is 33″ X 28″” inches and is featured on the front of Episode 8 in the Great Liners Video series, “Echoes of the Mersey“.